The month when cozy sweaters and boots are seen all over town, along with scarves and hats too! Hot coffee and cuddles by the fire become a favorite activity and planning for the holidays are in full effect! Yes, I am one of “those people” that play holiday music on their Pandora right after Halloween is over! Hard to imagine another Thanksgiving is almost here. It seems like a few months ago we were planting the summer garden! Every year we host the holiday dinners at our house. With two cooks in the house, it’s hard not to! Andrew and I both love to cook for our friends and family, so we are always thrilled when this time of year rolls around. One thing you will never see in our house is that red box of what they call “stuffing”… the fake stuff that most of us probably grew up with. Everything at our house is made from scratch. It tastes better and half the fun is cooking! I like to add vegetables whenever possible to most things I cook. Like this meatloaf and these pumpkin carrot bars :) This gratin is full of greens and mushrooms and lots of cheese! I’m sure there are some people who will argue with me, but I swear by never ever cooking the stuffing in the bird. Your cook time is longer and the bird is not as moist in my opinion. We like to stuff the bird with apples, onions and herbs. It brings out a great flavor, along with brining the turkey for that moist meat. Another reason to make your stuffing on the side is to experiment with all these great textures and flavors! 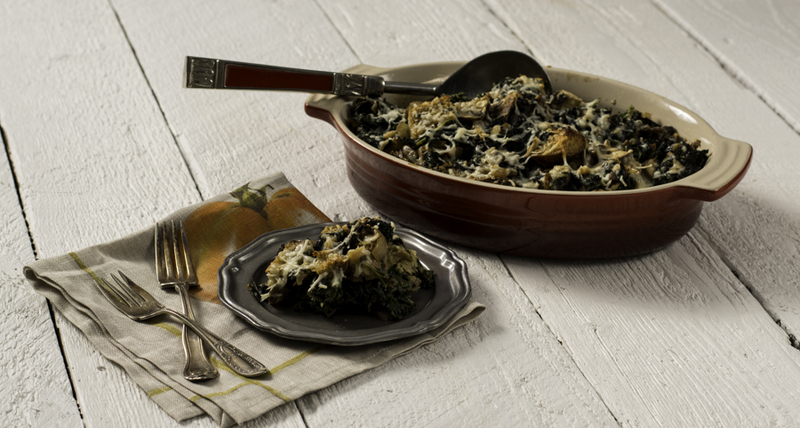 Stuffing, gratin…whatever you decide to call it, this one is my favorite so far! You will want to use a really good bread from your favorite bakery, after all it is the base of the gratin. I used a whole wheat from Pearl Bakery, that has subtle hints of nuts and berries in the bread. The older the better, you want a almost stale dried out bread for your gratin. And of course let’s talk about the cheese! 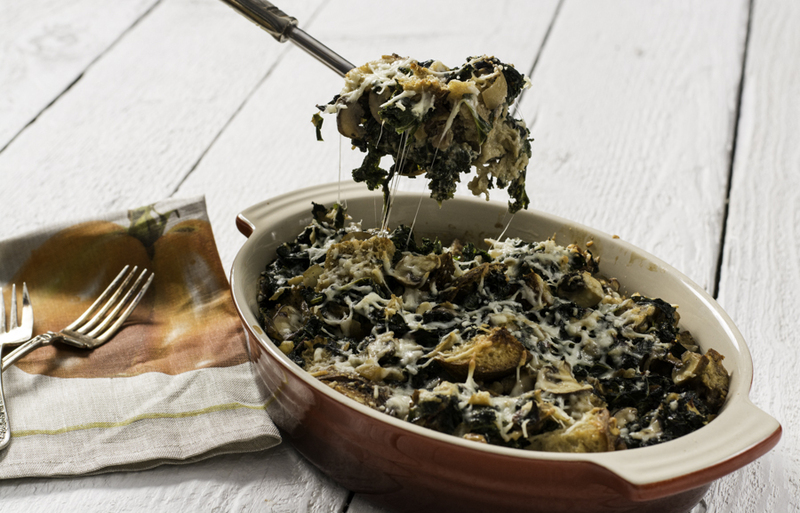 I choose Asiago, it’s strong flavor holds up to all the other ingredients in this gratin and pairs so well with the mushrooms. I guarantee, once you try this gratin, you will never go back to your old standby! 1/2 to 1 C shredded asiago cheese, I like a lot of cheese so I used 1 cup! Cook the onions, garlic and mushrooms until soft. In a large bowl, mix the eggs, cream, cheese, and chicken stock. Add the cubed bread to the bowl and mix. Next add to the bowl, the cooked vegetables, mix until combined and season with salt and pepper. Lightly grease a 3 qt casserole dish and pour gratin mix into dish. Cover with foil and bake for 30-45 minutes. 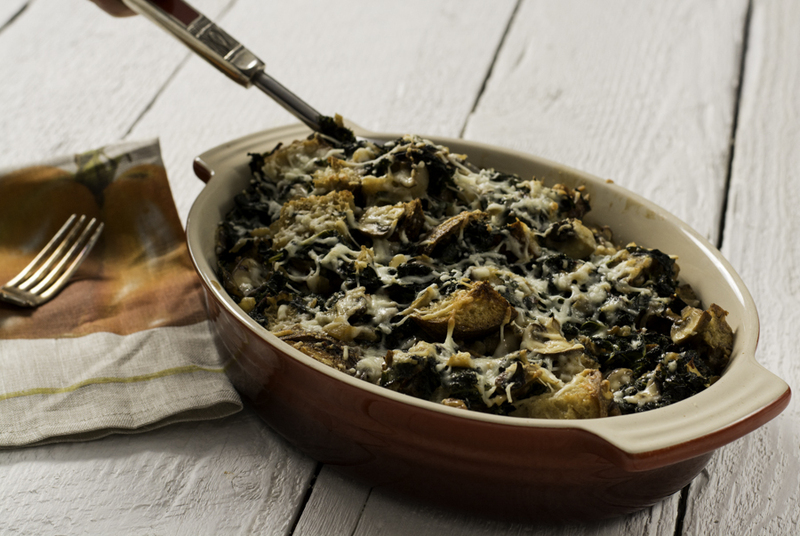 Gratin should be hot and bubbly and lightly browned on top. Hmmm, I may try this! I’m trying to find new ways to eat kale! I’m all for holiday music, too, though I make myself wait until after Thanksgiving. I wouldn’t want to burn out on Bing Crosby! I don’t think I’ve ever had the boxed stuff either, but my family wasn’t particularly big on stuffing. This recipe looks delicious and perfect for fall! We made this last weekend for our foodie group. So delicious! I was lucky enough to have some leftovers for lunch the next day, too! Hey Meghan, I’m so glad to hear! Cheers!